Back in May I blogged about a run series called The Color Run. First off, where on earth has time gone!? Gabe and I were originally going to run the Color Run Orlando when it was scheduled for December 3rd. It has since moved to January 13th which is during the Disney Marathon Weekend. The reason we chose to run Orlando over our neighboring city, St. Petersburg was due to the fact that the Color Run St. Pete is the same day Gabe graduates with his Masters in Mental Health and Rehabilitation from USF. Due to the conflict with Disney Marathon Weekend, we have decided to run Color Run St. Pete instead. Let's hope the paint from the Color Run washes off or my boyfriend will be accepting his diploma looking like an Easter egg and that will make for really fun graduation photos! 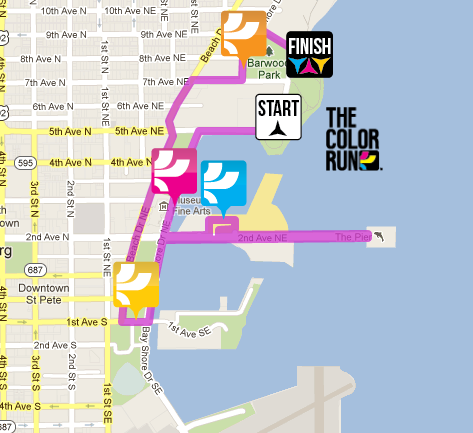 Here is the Color Run St. Petersburg Course Map. I absolutely love this course and am very excited that we will be running down the Pier! The two charities for the Color Run St. Pete are JDRF, curing type 1 diabetes and St. Anthonys Hospital, BayCare Health System. This race benefits two wonderful organizations and there is still time to sign up for the Color Run St. Pete. 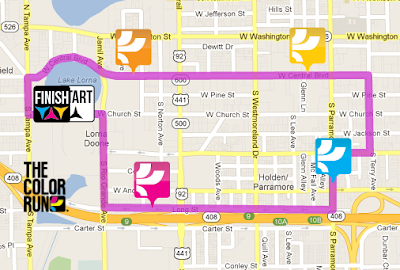 Click here for more information about this race! I so want to do one of these! It's on my list for this upcoming year... even if I have to travel somewhere to do it! Come visit FL to run one! !